CD review: "Don't Let the Smooth Jazz Fool Ya"
This review first appeared in the February 14, 1998 edition of the American Reporter. The title of the latest CD from guitarist Doc Powell is a bit confusing. Don't let the smooth jazz fool us into what? Thinking this is really jazz? Because it isn't. Into thinking Powell is a good guitarist? Don't know  he might be, but who could tell from this album? This isn't a bad album, it just isn't jazz  it's easy listening in a George Benson sort of vein. And taken on that level, it makes for nice mood music. 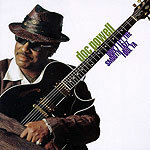 Powell plays a hollow-body guitar (as do Benson and Earl Klugh), giving his playing a sweet, fat sound. His solos are lively, perhaps improvised. His songs are upbeat, pop tunes with nice melodies and breezy arrangements. And the side players are all competent. The frustration that serious music lovers will have with this album  as with others in the Kenny G genre --is the hints of real artistry that Powell tosses our way before pulling back to play it safe. They guy can probably flat-out play guitar  remember Benson before he went Lights Out Jazz?  but he keeps his solos safe and non-offensive, which makes it hard to compare him to jazz musicians who've earned their chops the hard way. Hey, looking for a nice album to play behind a candlelit dinner or to relax to before bed? This is as good as any. But if you want something to hold your attention as listening material, you'll need to look elsewhere.